Taxodium /tækˈsoʊdiəm/ is a genus of one to three species (depending on taxonomic opinion) of extremely flood-tolerant conifers in the cypress family, Cupressaceae. The generic name is derived from the Latin word taxus, meaning "yew", and the Greek word εἶδος (eidos), meaning "similar to." Within the family, Taxodium is most closely related to Chinese swamp cypress (Glyptostrobus pensilis) and sugi (Cryptomeria japonica). Species of Taxodium occur in the southern part of the North American continent and are deciduous in the north and semi-evergreen to evergreen in the south. They are large trees, reaching 100–150 ft (30–46 m) tall and 2–3 m (6.6–9.8 ft) (exceptionally 11 m or 36 ft) trunk diameter. The needle-like leaves, 0.5–2 cm (0.20–0.79 in) long, are borne spirally on the shoots, twisted at the base so as to appear in two flat rows on either side of the shoot. The cones are globose, 2–3.5 cm (0.79–1.38 in) diameter, with 10-25 scales, each scale with 1-2 seeds; they are mature in 7–9 months after pollination, when they disintegrate to release the seeds. The male (pollen) cones are produced in pendulous racemes, and shed their pollen in early spring. 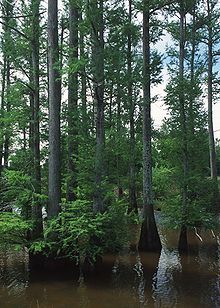 Taxodium species grow pneumatophores, or cypress roots, when growing in or beside water; these are woody projections which rise above the water and are said to help carry oxygen to the root systems. The three extant taxa of Taxodium are treated here as distinct species, though some botanists treat them in just one or two species, with the others considered as varieties of the first described. The three are distinct in ecology, growing in different environments, but hybridise where they meet. Taxodium ascendens Brongn. pond cypress Occurs within the range of bald cypress, but only on the southeastern coastal plain from North Carolina to Louisiana. It occurs in still blackwater rivers, ponds and swamps without silt-rich flood deposits. Taxodium distichum (L.) Rich. bald cypress Native to much of the southeastern United States, from Delaware to Texas, especially Louisiana and inland up the Mississippi River to southern Indiana. It occurs mainly along rivers with silt-rich flood deposits. Taxodium mucronatum Ten. Montezuma cypress, ahuehuete, sabino Occurs from the Lower Rio Grande Valley south to the highlands of Guatemala, and differs from the other two species in being substantially evergreen. A specimen in Santa María del Tule, Oaxaca, the Árbol del Tule, is 43 m (141 ft) tall and has the greatest trunk thickness of all trees, 11.42 m (37.5 ft) in diameter. It is a riparian tree, occurring on the banks of streams and rivers, not in swamps like the bald and pond cypresses. The trees are especially prized for their wood, of which the heartwood is extremely rot- and termite-resistant. The heartwood contains a sesquiterpene called cypressene, which acts as a natural preservative. It takes decades for cypressene to accumulate in the wood, so lumber taken from old-growth trees is more rot resistant than that from second-growth trees. However, age also increases susceptibility to Pecky Rot fungus (Stereum taxodii), which attacks the heartwood and causes some damaged trees to become hollow and thus useless for timber. Bald Cypress wood was much used in former days in the southeastern United States for roof shingles. The shredded bark of these trees is used as a mulch. In earth's history Taxodium was much more widespread in the Northern Hemisphere than today. The oldest fossils were found in Late Cretaceous deposits from North America. The trees persisted in Europe until around 2.5 million years ago, during the Pliocene. ^ Everett, Thomas H. (1982). The New York Botanical Garden Illustrated Encyclopedia of Horticulture. 10. Taylor & Francis. p. 3299. ISBN 978-0-8240-7240-7. ^ "GRIN Species Records of Taxodium". Germplasm Resources Information Network. United States Department of Agriculture. Retrieved 2010-11-30. ^ Buchanan, M. A. (1965-10-07). "The Fatty Materials in Southern Cypress Wood" (PDF). Institute of Paper Chemistry: 3. ^ Sternberg, Guy; James Wesley Wilson (2004). Native trees for North American landscapes: from the Atlantic to the Rockies. Timber Press. p. 476. ISBN 978-0-88192-607-1. ^ Toliver, L. P.; Wilhite, J. R. (1990). "Taxodium distichum". In Burns, Russell M.; Honkala, Barbara H. (eds.). Conifers. Silvics of North America. Washington, D.C.: United States Forest Service (USFS), United States Department of Agriculture (USDA). 1. Retrieved 2009-10-11 – via Southern Research Station (www.srs.fs.fed.us). ^ Eckenwalder, James E. Conifers of the World. Timber Press. p. 591. ISBN 978-0-88192-974-4. Wikimedia Commons has media related to Taxodium.